In a few weeks we are going to another wedding. I now know what to expect when taking small children to a wedding, namely NOT a relaxing fun filled day getting drunk. No, I will be spending the day chasing Son 1 round trying to persuade him not to blow raspberries at everyone who says "hello" to him and using my super Mummy strength to hold him still while pictures are taken. Son 2 is actually easier to deal with as he has the happy habit of sleeping during delicious meals so I can actually eat something. However I know the evening will be a write off. This is when Son 1 will turn into a completely uncontrollable monster and Son 2 will be taking part in uncontrollable crying. I can't wait! However I went to try it on the other day and couldn't get it over my head! Oh the shame. Anyway I have decided to go with something I can actually wear again. I also need to get something that is washable for obvious reasons....messy hands and dribbly mouths. The problem with Coast is that most of their stuff is dry clean only, and duchess satin is a pig to get things out of. Now for shoes! I have clown feet so for me shoe shopping is hell and is something I must do alone as I drive everyone mad with my huge feet. They seem to be even bigger than normal these days, a result of pregnancy? Who knows, all I know is that they suit trainers and boots best. But neither of these things are suitable for a wedding. I spotted these torture devices, sorry, shoes in Aldo and think they would go wonderfully with the navy version of the dress. I love the spiky heel and think it looks a lot more expensive than £31.49 (in the sale). I'm just picturing myself running round all day chasing after two children in these....*shudder*. Great post-made me laugh although I felt a bit guilty-weddings with the kids is really hard work isnt it! Thanks! I think I will go for that dress just waiting for Friday when Oasis sometimes do 15% off. Weddings just aren't the same are they?! I think I like the red one best, and it'll be as versatile as you make it. Sometimes it's more that we lack the confidence to wear red when out and about but I'm sure I once read that it's a very empowering colour to wear. Either way, all the outfits were lovely - especially the shoes (bargain!) I tend to wear posh shoes during the day but have a wee pair of slip ons for the evening. Or if it's a family wedding we usually all end up barefoot! Good luck! Thanks! 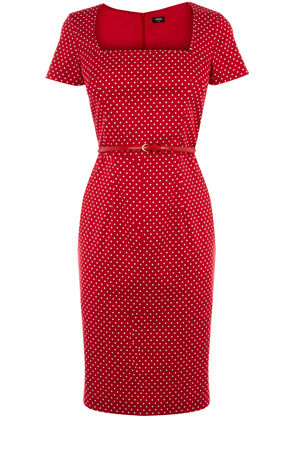 I bought the navy one in the end but now thinking the red one so I can wear red shoes! I love the shoes but do you think they will be suitable for a size 8/9 with extra wide feet! ouch! It looks good on! I'm really pleased with it. The ironic thing about not being able to get the other dress over my head is that I have a really tiny head! Normal hats end up over my eyes and finish down by my chin. So I'm not sure WHO would be able to get that dress on! Hey! Just a quick question.Did you manage to get those shoes fom Aldo.I've never really worn high heels, but I love these shoes.I was planning to get them on sale.Just wanted to find out if they're comfortable or extremely painful to walk in.Thank you. To be honest I didn't get them, I just couldn't face it! Are they still available?